Mysterious lights have flickered above Crownsville for as long as Mia can remember. And as far as she's concerned, that's about the only interesting thing to happen in her small town. That is, until Sol arrives. Mia's not one to fall for just any guy, but she can't get Sol--or the brilliant tattoo on his back--out of her mind. Then Mia's brother goes missing, and Mia's convinced that Sol knows more than he's sharing. But getting closer to Sol means reevaluating everything Mia once believed to be true. Because Sol's not who Mia thought he was--and neither is she. Hi, Sara! Thank you so much for agreeing to take some time from your busy schedule as a debut author to answer some questions for us here at Bibliophilia, Please. Let’s break the ice a little – what is something funny about you that only your friends know? Hi, Kayla! Thanks for inviting me over! I’m the kind of person who finds it very easy to make myself look silly, so it’s tough to pick just one funny thing! One thing that only my friends would know is that I throw a mean outdoor disco. Lights. Music. The works. You’re all invited. Now that we’re all friends, let’s did around in your head a little. In the synopsis of your debut novel, The Dark Light, Sol’s “brilliant tattoo” is mentioned. Is there a tattoo that you saw that inspired it? You know, there really wasn’t a specific image. I knew Sol was going to have a tattoo and that tattoos were going to play a really important part in the story, but until the moment we first see the tattoo in the story, I didn’t have a very strong idea of how it was going to look. I knew I wanted it to be color, and it was the image of these bright, almost metallic shades--reds and greens and gold--that drove the visualization of the image, though, of course, the cover is in gray. I also hadn’t planned on Sol’s tattoo being quite so large, but once I started writing, I was like, “Let’s just go for it!” and that’s how it ended up being that size. The story is set in Crownsville (and I’m assuming that’s Maryland), but it’s based on a story from Nebraska. Can you tell us a little bit about how you weaved those two locations together? I was actually living in Kansas when I first came up with the idea for The Dark Light, and it was always going to be a story centered on the American plains. I was actually writing a different story when I first got the idea and it wasn’t until several months later that I was able to sit down and start to write. Everything was in place to start work but for the name of the town where the story was going to kick off. It was then that we moved from Kansas to Maryland. On the journey, we were heading south past Baltimore when I saw a sign for a town called Crownsville. As soon as I saw it, I knew that was the name of the town where Mia would live--Crownsville, Nebraska--the final piece of the puzzle. I started writing not long after that. A little bird told me that you were British. (Okay, it was your bio.) Did you sneak a little bit of the UK anywhere in the story? I tried very hard not to let parts of the UK sneak into the story, especially in terms of Mia. It definitely is a challenge. I do have a team of readers who look out for little slips, and my editor and copy editor look out for those things too. I’m sure I’ve given them a giggle on more than one occasion. I gave myself more of a break when it came to writing the fantastical aspects of the story. I do actually have a couple of stories I’d like to set in the UK, including a historical urban fantasy set at the time of the Great Fire of London. You know, they were all fun in different ways, especially Mia and Sol. One of my very favorite characters to write was a character called Vermillion Blue, who appears later in the story. She’s a freedom fighter with a few special tricks up her sleeve. She’s fierce. Did you have any unique writing habits while working on your novel? I just try to write something every day. I have to admit, I’m not a writer who can work in public places like a coffee shop or the library. I’m too easily distracted. I have an office at home where I spend a huge portion of my life. I like to be able to sit down and pick up where I left off last time. I’m always thinking about stories, though. I’m often caught staring into space. What did you find the most surprising about the publishing process, and how long did it take you to get through it? The time from my publisher acquiring The Dark Light to publication will be a little over eighteen months. There haven’t been too many surprises--the process kind of unfolds around you. I was very nervous going into my first round of edits, because that’s the real creative work and you don’t want to let yourself down. It actually turned out to be my favorite part of the process. Things start to get exciting once you reach the production phase of publication and so many amazing people start to work on turning your manuscript from words on a page into a book that will appear on shelves. As many of my readers know, I have a little bit of an obsession with lolcats. Whenever I’m having a bad day, I can look at them and instantly be cheered up. What takes you to your happy place? My Saint Bernard, Rosie. She’s my best friend. And the one who gets to hear my stories first! She’s usually not far away from the office. Do you have any upcoming projects that you can share with us? I’ve been working on a couple of things, but nothing I can tell you too much about. Sorry! I do write a lot, so I often have stories I’m tinkering with or brewing in my mind. I’m not sure I could live long enough to turn them all into novels! Okay, this was the most addictive challenge ever. I decided to go with an Olympics theme, and chose this one! Thanks, Kayla! And, yes, eight copies each! Lol! Thanks so much for inviting me to your blog, and thanks to your readers for taking the time to listen. I love to chat, so please say “hi” if you see me around the web. I can usually be found around Twitter @SaraLeighWalsh. Be sure to add The Dark Light to your TBR list on Goodreads! 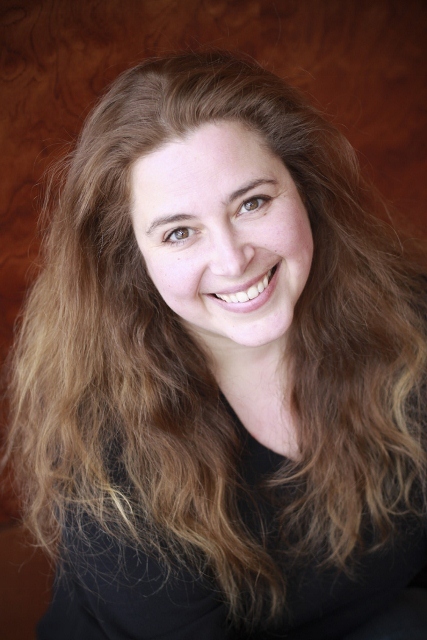 Sara Walsh is British, but happily lives in Annapolis, Maryland. She graduated college with a degree in psychology, but soon decided that telling stories was much more fun. When not writing, Sara is usually reading, drowning in tea, or frolicking around town with the world's cutest St. Bernard. The Dark Light is her first novel. Or leaving a blog post comment for Sara. Of course, I have a freebie entry for you because I could just squeeze you to bits for buying eight copies of the book. Okay, maybe you're not going to do that, but I still think you're awesome. Onto the Rafflecopter! a Rafflecopter giveaway Once again, thank you to Sara for the very fun interview and fantastic giveaway. Be sure to come return on Monday to meet another fantastic debut author! It's the first one that says "HAPPY DANCE TIME! ready go"
Does this count as a lolcat? If not, it definitely should! 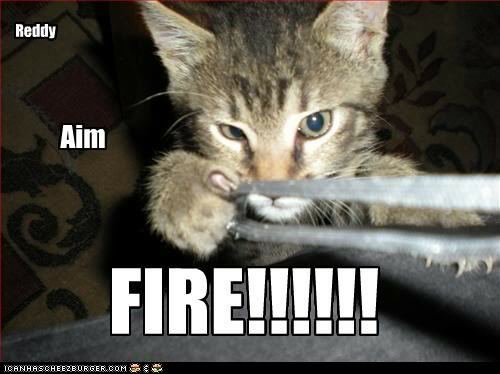 I know I should be nice and leave a comment for Sarah, but my favorite lolcat, since I have one is too tempting. What a fun interview. It was great to learn more about the author. I love the name Vermillion Blue. I wish her much success with her book and writing. The story sounds fascinating. Thanks for the giveaway! @Christina: I seriously LOL'd when I saw that. My coworkers have to be convinced that I'm a nutjob. Kayla, it cracks me up EVERY time. My friend and I may sometimes yell this at inappropriate times because we're so amused by it. No wonder everyone doesn't love us. Love how Sara got the name of the town, how she saw it and immediately wanted to set the story there. It sounds like an awesome story! Hey, guys! I hope Kayla doesn't mind me crashing in and saying hi! Thanks so much to everyone for reading the interview and entering the contest. And huge thanks for all the follows and Facebook likes. I really appreciate it. And, Kayla thank you so much for inviting me over to your fantastic blog! I can't wait to read this book! Thanks Sara! @Dovile: *shudders* So many babies! Hiiiiiiii!! Thank you so much for this amazing giveaway and for sharing this wonderful interview! <3333 I cant wait for this book!! This is possibly among my favourite author interviews, ever. And easily the best ending. Thanks for the great interview and giveaway! 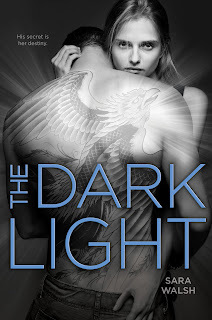 Sarah I can not wait to read The Dark Light, both the cover and the book look AMAZING! The name 'Sol' is really interesting. It reminds me of a character from a show I used to watch. I'm actually extremely allergic to cats, so I can't share a picture with you...but I can do a darn good cat imitation! "MEOW!!!" I loved The Dark Light ever since I read the blurb on Good Reads a few months ago :). This is such a great giveaway! Thank you for the opportunity to win :) I'm really late entering but hopefully I still have a chance! Thank you for all your comments! I so hope you guys who read the book enjoy it. Again, Kayla, thank you so much for inviting me over. It was such fun. And there's still a few hours to go! Good luck, everyone! Enjoyed your post, it's very interesting. Nice to read something different as well!